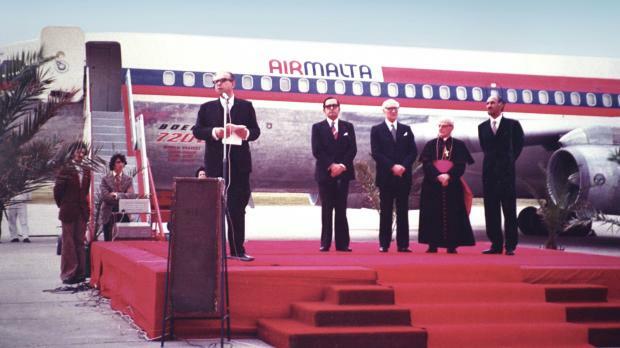 Then deputy Prime Minister Anton Buttigieg addressing guests present at the inauguration of Air Malta on March 31, 1974. Looking on from left to right are chairman Albert Mizzi, governor general Sir Anthony Mamo, Archbishop Mikiel Gonzi and Air Marshal Nur Khan, chairman of PIA. 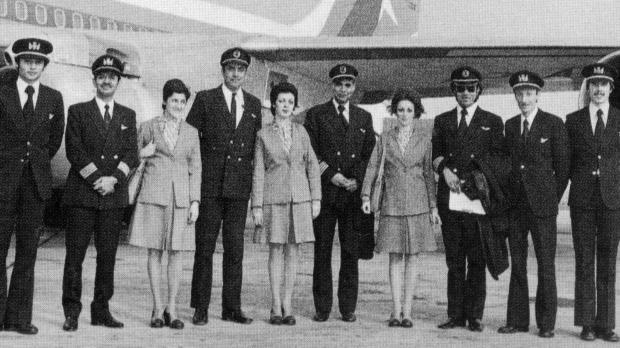 The crew of Air Malta's first flight. 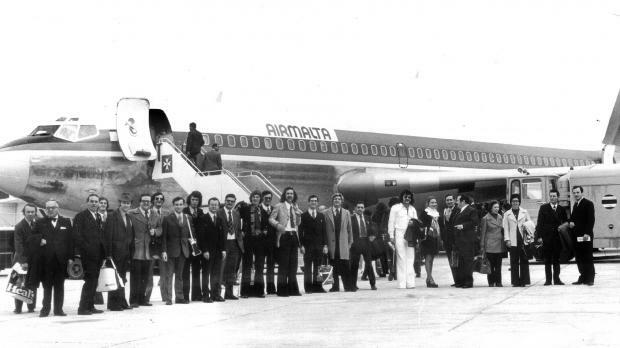 The passengers of Air Malta’s first flight to London Heathrow. Air Malta is gearing up to celebrate the 40th anniversary since its inaugural flight. The airline’s first flight, from Malta to London Heathrow, took off on April 1, 1974. The passengers on board the Boeing 720B aircraft were mostly journalists and travel agents flying to meet their British counterparts for a six-hour reception in London. To mark the occasion, Air Malta is planning a number of activities and initiatives including a special April edition of its in-flight magazine, ‘Il-Bizzilla’. In its first year of operation, Air Malta carried 53,459 passengers. This annual figure has now grown to 1.7 million, with almost 50 million passengers carried over the past 40 years. This year, the aviation community is also marking the 100th anniversary of the start of commercial aviation. The first scheduled commercial airline flight took place on January 1st, 1914 in Florida, from St Petersburg to Tampa.